This was first written for and published by The Sports Law & Policy Centre. An earlier version of this article was published as “Playing In The Corridor Of Uncertainty: The Impact Of The Justice R.M. Lodha Committee Report on Sports Governance In India” in the publication 'Game, Set and Matchless...A Reader on Sports Law' published by the National Law School of India University in 2016. On January 4, 2016, the Justice R.M. 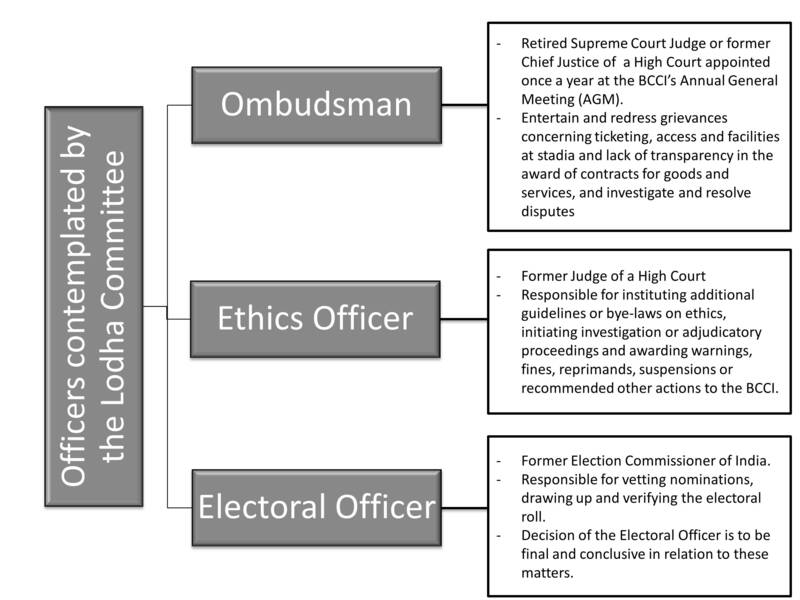 Lodha Committee (“Committee”) presented its "Report on Cricket Reforms" (the “Report”) to the Supreme Court of India. The Committee, which comprised of Mr. Justice (Retd.) R.M. Lodha, former Chief Justice of India, and former Supreme Court judges, Mr. Justice (Retd.) Ashok Bhan and Mr. Justice (Retd.) R.V. Raveendran, was constituted and appointed by the Hon’ble Supreme Court in its order dated 22nd January 2015, while disposing of Civil Appeal No. 4235 of 2014 (Board of Control for Cricket in India vs. Cricket Association of Bihar) and two other appeals (the “January Order”). While the Committee was primarily constituted to provide its recommendations in the aftermath of the findings presented by the Justice Mudgal Probe Panel in relation the 2013 Indian Premier League (“IPL”) spot fixing scandal, it was also mandated to examine and make suitable recommendations to the Board of Control for Cricket in India (“BCCI”) for such reforms in its functioning and practices as may be considered necessary and appropriate with the aim of, amongst other things, preventing sporting frauds and conflict of interests, improving player welfare, streamlining the functioning of the BCCI, and making it more responsive and accountable to the public at large. Through the Report, the Committee recommended a substantial overhaul of the manner in which the BCCI, and cricket in general, is governed and administered in India. In preparing the Report and in attempting to provide a comprehensive list of reforms, the Committee sought interviews and comments from several stakeholders and interested parties, including former and current sportspersons, administrators, regulators and lawyers. The recommendations provided under the Report are classified under ten (10) broad heads, each of which the Committee considered integral for the governance of cricket in the country. In the following section, we provide a brief overview and summary of the significant recommendations made by the Committee in the Report. Thereafter, in Section III we attempt to analyse a few of the key aspects of the Report and the potential ramifications and impact that the Report’s recommendations, may have on Indian cricket in particular and sports administration in India more generally. Section IV summarises the subsequent legal developments post the release of the Report and the current status of implementation of the Supreme Court’s orders, and Section V concludes the article. arbitrary addition and removal of member associations. Implementation of a "One State – One Member – One Vote" policy, keeping in mind the standards followed by most international sports governing bodies. In the event of multiple state associations or teams from a single state (as is the case in Gujarat and Maharashtra), a single association to be made a ‘Full Member’, with voting rights and the others may be inducted as "Associate Members", without voting rights. Non-state members such as Services, Railways and other similar non-state members to be accorded the status of Associate Members, without voting rights and retaining their right to participate in the relevant domestic tournaments. Removal of ‘Affiliate’ and ‘Future Member’ categories (currently accorded to states such as Telangana and Mizoram) with the BCCI to consist of only Full Members and Associate Members. With respect to the long standing practice of classifying the BCCI’s members into various Zones (North, South, East, West and Central), the Committee suggested that such Zones should retain their relevance only for the purpose of the tournaments conducted amongst themselves (such as the Duleep Trophy and the Deodhar Trophy) and the Zones should not play a role in the nomination of personnel to run the BCCI or serve in the BCCI’s various Standing Committees, which is the case currently. Disbursement of funds by the BCCI to its member associations for cricket development must not be uniform and must be made in accordance with a formalised policy to be notified by the BCCI, aimed at incentivising its members to develop the sport. Replacement of the existing fourteen (14) member BCCI working committee with an Apex Council (responsible for governing the sport) and a separate IPL Governing Council. 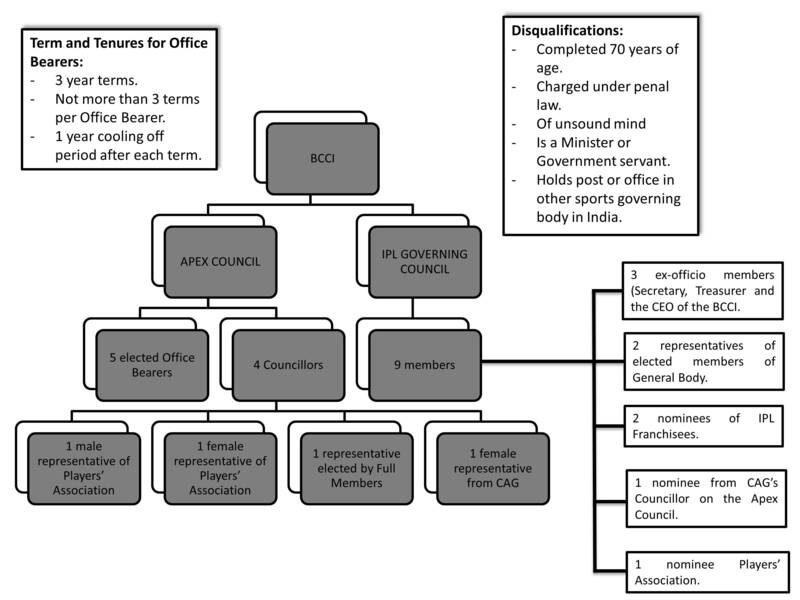 Constitution of the Apex Council to reflect a balance of representatives and independent members, with nine (9) members – five (5) elected office bearers and four (4) Councillors (one (1) male and one (1) female representative of the players’ association, one (1) representative elected by the Full Members of the BCCI and one (1) representative nominated by the Comptroller and Auditor General of India (“CAG”)). The terms and tenures for office bearers of the Apex Council to be fixed, by limiting them to three (3) years at a time and not more than nine (9) years in total in any instance. The Committee also recommended a cooling off period after each term served and prohibited consecutive terms. Any person who has: (a) completed seventy (70) years of age; or (b) is charged under penal law; or (c) is declared to be of unsound mind; or (d) is a Minister or Government servant; or (e) holds any post in any other sports body in the country to be disqualified from being a BCCI office bearer. Election of BCCI President to be made by all Full Members instead of a rotational basis, depending on the Zone of the candidates, which was the practice adopted earlier. In an attempt to ensure professionalism in the management of the BCCI, the Committee suggested the implementation of a corporate structure whereby the BCCI will be managed by “professionals with established skill-sets”. Appointment of a Chief Executive Officer (“CEO”) with strong credentials who will be assisted by a team of a six (6) managers to handle non-cricketing affairs and all non-cricketing and logistical concerns of players. The CEO to ideally have previous managerial experience for five (5) years as the Managing Director/CEO of a corporation with an annual turnover of at least Indian Rupees One Hundred Crores (INR 100,00,00,000/-). The large number of Standing Committees and Sub-Committees currently within the BCCI to be reduced to two (2) essential advisory committees (Senior Tournaments Committee and the Tours, Fixtures and Technical Committee) that would advise the CEO with reference to tours, technical aspects and tournaments. Figure 4: Suggested Management Structure. Establishment of seven (7) cricket committees that oversee all selection, coaching, performance and evaluation matters across all categories, including disabled and women’s cricket. Each of the cricket committees to consist of three (3) members who shall be former players/cricketers themselves. Selection committee of the men’s senior team to consist of only former test players with the player having the most caps being the head of the committee. Constitution of an IPL Governing Council, comprising of nine (9) members – three (3) ex-officio members (the Secretary, Treasurer and the CEO of the BCCI), two (2) representatives of the elected members of the General Body, two (2) nominees of the franchisees participating in the IPL (“Franchisee”), one (1) nominee of the CAG’s Councillor on the Apex Council and one (1) nominee of the Players’ Association. Representation of the Franchisees on the IPL Governing Council to be on an annual rotational basis, ensuring that every Franchisee is nominated at least once before a Franchisee is nominated for a second term. All bodies that are appointed under the IPL rules and regulations to consist of members selected by a panel of the BCCI Ombudsman, the Ethics Officer (both discussed in greater detail below) and the CEO. A fifteen (15) days break to be provided before and after the IPL season with respect to the national cricket calendar. The players’ association to be brought into effect by an Honorary Committee consisting of four (4) members, which shall serve as the Steering Committee. The Steering Committee to: (a) identify and invite all eligible ex-cricketers to be members of the players’ association; (b) open bank accounts and manage funds for the players’ association; (c) receive funds from the BCCI; (d) conduct the first elections for office bearers; and (e) communicate the names of BCCI player nominees to the BCCI and take all necessary steps in this regard. The Committee observed that there was lack of awareness in relation to conflict of interest situations amongst the majority of its interviewees and also within the BCCI itself. In an attempt to provide a working policy in this regard, the Committee examined the functioning of various international sports bodies and the practices adopted by them in dealing with situations of conflict of interest. The Committee recognised that preventing conflict of interest is integral to the regulation of ethical conduct in sport. In providing its recommendations, the Committee expressly defined five (5) forms of conflict of interest and provided illustrations for each such form for better understanding. 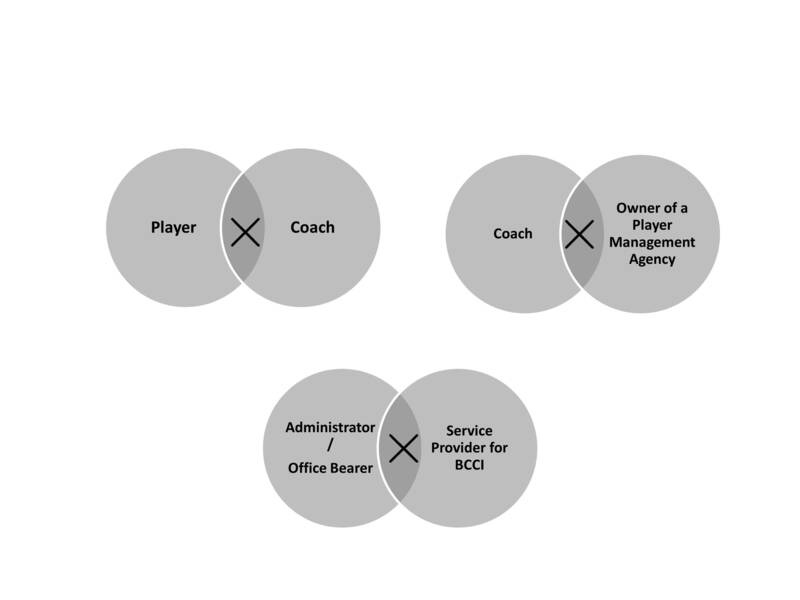 Each specific situation of conflict of interest was applied to individuals employed with, or connected to the BCCI with separate solutions or sanctions. Position of Influence - Where an individual is in a position of influence that may compromise decision making, control or management in relation to such individual’s friends, relatives or close affiliates. Intractable - which are unresolvable and would necessitate the removal of the concerned individual from his/her position to cease the conflict of interest. The office bearers of the BCCI are required to make full and complete disclosure in writing of any existing or potential event that may lead to a conflict of interest in the discharge of his/her duties. All such information is to be uploaded on the BCCI website in order to maintain transparency and in the event any relevant information is withheld or the office bearer fails to make complete disclosure in this regard, he/she may face disciplinary action. The Full Member associations of the BCCI are also required to adopt and observe all the above ethical principles including those concerning conflict of interest. Owner of a Private Cricket Academy. Ombudsman – The Ombudsman to be a retired Supreme Court judge or a former Chief Justice of a High Court, appointed on an annual basis at the BCCI’s Annual General Meeting (AGM). The Ombudsman shall, either on a reference by the Apex Council or on a complaint by a member association/Franchisee/Zone/players’ association/ Player/Team Official/ Administrator or on a suo motu basis, investigate and resolve any dispute between or among these entities by following due principles of natural justice, production of evidence and fair hearing. The Ombudsman may also entertain and redress any grievance or complaint by members of the public if such grievances or complaints concern ticketing, access and facilities at stadia and lack of transparency in the award of contracts for goods and services. Ethics Officer – The Ethics Officer to be a former Judge of a High Court and shall be responsible for instituting additional guidelines or bye-laws on ethics, initiating investigation or adjudicatory proceedings and awarding warnings, fines, reprimands, suspensions or recommended other actions to the BCCI. Electoral Officer–The Electoral Officer to be a former Election Commissioner of India and be responsible for scrutinizing nominations and clearing them, drawing up and verifying the electoral roll after identifying appropriate representatives of the Full Members, ensuring that no candidate falls foul of the BCCI’s rules, conducting elections to the Committees under the rules and declaration of results. The decision of the Electoral Officer is to be final and conclusive in relation to these matters. The Legislature was asked to consider bringing the BCCI within the purview of the Right to Information Act, 2005 (“RTI Act”). Revision of all existing contracts of the BCCI as the Committee was of the view that the BCCI does not have fair and transparent criteria for awarding contracts or appointment of auditors and lawyers. Establishment of fixed norms and procedures for engagement of service professionals and contractors, and ensuring full transparency of all tenders floated and bids invited by or on behalf of the BCCI. Clear principles of transparency to be laid down, and the BCCI website and office to carry all rules, regulations and office orders of the BCCI, the constitution of the various committees, their resolutions, the expenditures under various heads, the reports of the Ombudsman/Auditor/Electoral Officer/Ethics Officer and the annual reports and balance sheets. Several recommendations in relation to advertisements during the broadcast of cricket matches, including that the entire space of the screen during the broadcast to be dedicated to the display of the game, save for a small sponsor logo or sign. Further, the Committee recommended that advertisements may be permitted during broadcasts only in breaks taken by both teams for drinks, lunch and tea, as is the practice internationally. In this regard, the Committee opined that broadcasters cut away to commercials at the stake of the game thus, depriving the viewers of on-field activity in between overs and on occasions, during the overs as well. Introduction of laws to make match fixing a criminal offence. Establishment of a Disciplinary Committee formed under both BCCI and IPL regulations to address match fixing cases, which committee should consist of the Ombudsman, the Ethics Officer and the BCCI CEO in order to facilitate independence in the grievance redressal process. Legalisation of betting in India, albeit with certain safeguards in place including regulatory watchdogs, licenses for placing bets and penal sanctions. Betting by Administrators, Players, Match Officials, Team Officials, Owners, etc., to be prohibited under all BCCI and IPL related rules and regulations. BCCI to take measures to educate and sensitise cricketers, particularly youngsters about game ethics. Provisions to be made for lectures, classes, handbooks and mentoring of young players by former players of repute through an ‘Integrity Unit’. BCCI to coordinate with state machinery to form a dedicated special investigation wing to look into such matters. Sharing of a database of undesirable elements, including bookkeepers, fixers etc. maintained by BCCI – ACU with players and team officials. Background checks to ascertain any criminal antecedents of persons in control of a Franchisee. Full Members to restrict the tenures of office bearers and prescribe disqualifications, do away with proxy voting, provide transparency in functioning, be open to scrutiny and audit by the BCCI and include players in membership and management. Full Members to abide by the conflict of interest policy prescribed by the BCCI. All members to also appoint an Ombudsman and/or Ethics Officers to address ethics and conflict of interest related issues. All member associations to cease being social clubs and be governed and managed professionally. Appointment of an independent auditor by the BCCI to verify how the Full Members have expended the grants given to them by the BCCI, to record their targets and milestones, and to submit a separate compliance report in this regard. Each state association (including Full Members and Associates) to maintain individual websites with access to such documents that are necessary for transparent and accountable functioning. The Committee’s recommendations appear to have been provided after much deliberation and thorough examination of Indian cricket in general. The recommendations are comprehensive and pervade every aspect of cricket administration and governance in the country with almost no exception. This section aims to discuss a few of the major trends and themes in the Report and the potential impact that the Committee’s recommendations may have on the Indian cricket and sports management ecosystem. While the Report addressed several key issues facing Indian cricket currently, it is apparent that restructuring the governance of the BCCI was the primary aim and the overarching theme of the Report. In this context, the proposals to introduce a simplified, two tiered membership structure with a "One State – One Member – One Vote" policy for Full Members and reducing the relevance of Associate Members and ‘Zones’ in the context of elections and functioning of the BCCI, are perhaps the most significant recommendations made by the Committee. 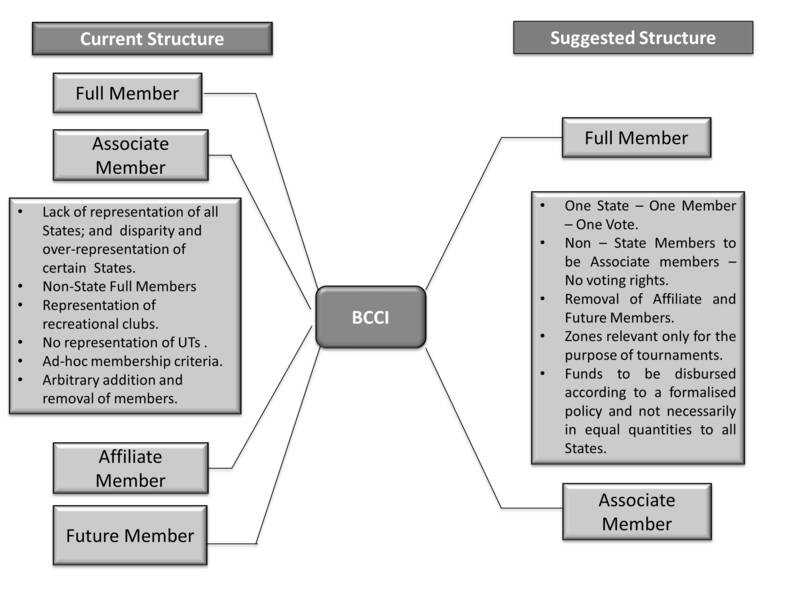 The current membership structure of the BCCI was seen by the Committee as facilitating the concentration of power and voting rights. For example, states such as Gujarat and Maharashtra together contributed 7 members and votes between them. This potentially enables members from particular regions, who will likely have similar interests, to form factions and voting blocs and exert significant influence over the functioning of the BCCI. The ‘One State – One Member – One Vote’ membership model is followed by several other established global and national federations across sports. For example, Fédération Internationale de Football Association (FIFA) provides that each member association (which is conventionally the national football federation of a particular international state), is the sole representative of its jurisdiction at FIFA and is provided with one vote that theoretically carries as much weight as any other member association’s vote in the FIFA Congress even if such member is a historically smaller or newer nation in the football environment. Similarly, restructuring the membership of the BCCI in the manner proposed by the Committee may result in a more equitable distribution of power and voting rights among all Indian states, and thereby more widespread and homogenous development of the sport across the country. Further, the planned overhaul of the BCCI management structure including the dismantling of the all-powerful BCCI Working Committee (which is currently the principal decision-making body in the BCCI) in favour of a new Apex Council, aims at decentralising power within the BCCI and decreasing the influence of certain member associations. The Mumbai Cricket Association, Tamil Nadu Cricket Association, Cricket Association of Bengal, Delhi and District Cricket Association and Uttar Pradesh Cricket Association are currently granted permanent representation on the BCCI Working Committee along with BCCI office bearers, with other members being provided representation on a rotational basis, which in turn is based on the Zone in which each member is based. The Apex Council however, is proposed to have only one representative of all Full Members along with a mix of BCCI office bearers, male and female players’ association representatives and a nominee of the CAG. This recommended composition is the Committee’s attempt to bring in some form of independent input and supervision in the management of the BCCI, a practice that is widely followed by corporate entities through the appointment of independent directors on their boards. In the cricket world, Cricket Australia has also undertaken a similar restructuring in management over the last few years, with a board that now consists exclusively of eight (8) independent directors directing the affairs of Cricket Australia. The Committee also proposed a clear separation between governance and management. It has recommended the appointment of a CEO and specified strict criteria with respect to the appointment, election and nomination of all officers and senior personnel, including BCCI office bearers, the CEO and his team, members of the two councils and the cricket committees. It is notable that the Committee has recommended a blanket ban on ministers, government servants and persons already holding honorary posts in other sports bodies from holding posts within the BCCI. Also, the revised management structure consisting of the Apex Council and the IPL Governing Council, the CEO and the various cricket committees clearly demarcates the administration of the BCCI and IPL. This separation is a model that is widely followed in football internationally, where the national football association undertakes the development and growth of the game and the selection of the national teams whereas the administration of the professional football leagues is done by a separate sub-committee or in some cases, an entirely different entity that is formed exclusively for this purpose. This ensures a level of independent decision making even if the overall institutional agenda is common. Most of the recommendations discussed above faced resistance from within the BCCI, which filed a counter affidavit in the Supreme Court on 3 March, 2016 (“Counter Affidavit”), stating the BCCI’s reservations against the implementation of the Report and opposing several of the major recommendations. With respect to the proposed membership structure, the BCCI argued that restricting full membership status (and therefore voting rights) only to state associations may be unfair on certain non-state associations such as Saurashtra and Mumbai, who have, historically, made significant contributions to the development and growth of cricket in India and according to the BCCI, should therefore be entitled to be treated as Full Members. The BCCI also opposed the proposed age cap of seventy (70) years on office bearers and the cooling off period between terms. The BCCI also argued that the ban on ministers, government servants and persons holding honorary posts in another sports body from being part of the BCCI, is in violation of the constitutional freedom of association under Article (19) (1) (c), and “patently unreasonable” and that it would be unjust to deny an individual the full right to his freedom of association and the necessary core right to be part of the management of the affairs of such association and have a say in its functioning. Such a restriction, the BCCI states, would also hamper continuity of meritorious and deserving administrators and impact the development of cricket. One of the major criticisms faced by the BCCI over the last few years is the perceived lack of transparency in its functioning. This actual or perceived lack of transparency could be partly attributed to the fact that the BCCI’s as well as its member associations’ documents/records that are integral to their functioning were previously not available to the public for inspection. The Committee sought to tackle this issue head on through the Report by recommending that the BCCI publishes various documents relating to its functioning on the official website, including rules and regulations relating to the BCCI and IPL, the financial outlays undertaken by the BCCI with respect to series and tournaments such as the IPL, audited copies of the BCCI’s accounts and annual reports. In an effort to pre-empt the Committee’s recommendations, the BCCI began publishing various important documents related to its functioning on its official website, including its constitutional documents, the decisions of the BCCI appointed ombudsman and monthly disclosures of any payments in excess of Rs. 25,00,000, prior to the release of the Report. Importantly, the Full Members under the revised membership structure are also required to publish such documents with respect to their operations and the manner in which they use the funds granted to them by the BCCI on each of their respective websites. BCCI member associations have previously been granted a substantial level of autonomy and independence in the manner in which they use the funds and due to the lack of transparency, this has often resulted in there being allegations of unaccounted transactions and embezzlement of funds with respect to several members. The above recommendation, coupled with the requirement that the BCCI’s auditor carries out a performance audit of each member association to determine whether it has utilised funds to develop cricket in its region, will bring about some much needed accountability and oversight in their functioning. Further, as the disbursement of future funding from BCCI is proposed to be made dependent on the performance of the state associations in such audit, this may prompt member associations to streamline their operations and ensure that funds provided by the BCCI are used exclusively for the development and growth of cricket. These disclosure obligations are akin to obligations placed on corporate entities around the world and in consonance with conventional principles of good corporate governance. This is not a radical approach in the world of sports administration. Several professional sporting organisations and governing bodies across the world have adopted such principles with respect to their functioning, even if the bodies themselves are not necessarily corporate entities. The most instructive and relevant example in the cricket world is Cricket Australia, which regularly publishes its annual report and other relevant information in the interests of full disclosure to its main stakeholder, which is the Australian public. Similarly, with respect to the BCCI and the Report, the recommendations of the Committee may be considered an extension of the Supreme Court’s assertion that the cricket watching citizens of India form the largest and the most important stakeholders in the sport. Perhaps the most significant recommendation made by the Committee with respect to transparency however, is the recommendation to bring the BCCI under the purview of the RTI Act. The RTI Act can be extended to the BCCI only if the BCCI is declared as or satisfies the definition of a “public authority” under the RTI Act. Whether or not the BCCI is a public authority has been a source of much debate in the past with most arguments depending on whether the BCCI performs a “public function” and thereby satisfies the test of being a public authority. The first instance of the court trying to determine whether the BCCI performs public functions was in the Zee Telefilms Ltd. and Anr. v Union of India and Ors. (2005) wherein the court ruled that while the BCCI was not a “state”, it was however, by selecting an Indian team, controlling the activities of players and others in the cricket system like match officials, scorers, administrators, effectively performing “public functions”. This view was reinforced by the Supreme Court in the January Order where it held that the functions of BCCI are clearly “public functions” and was amenable for judicial review under Article 226 of the Constitution. However, the Supreme Court has refrained from declaring whether this would be enough to make the BCCI amenable to the RTI Act and the issue is currently sub-judice in the Madras High Court. While the Committee refrained from providing an overall code of ethics – a practice that is widely followed by most major organisations around the world – it provided an extremely detailed and coherent set of rules and guidelines relating to conflict of interest. These guidelines come at a particularly relevant time in the current international sporting landscape with not only the BCCI, but also other major sporting organisations such as FIFA and the International Association of Athletics Federations (IAAF), grappling with controversies borne of out of conflict of interest and other ethics-related issues. In terms of sheer scope and applicability, the guidelines on conflict of interest appear to borrow cues from the conflict of interest policy followed by the International Olympic Committee’s (IOC) in its Code of Ethics, which policy is applicable to almost any person involved in the Olympic movement. Similarly, the guidelines proposed by the Committee are also applicable to most persons involved in the administration, governance, playing, organisation and conduct of Indian cricket. 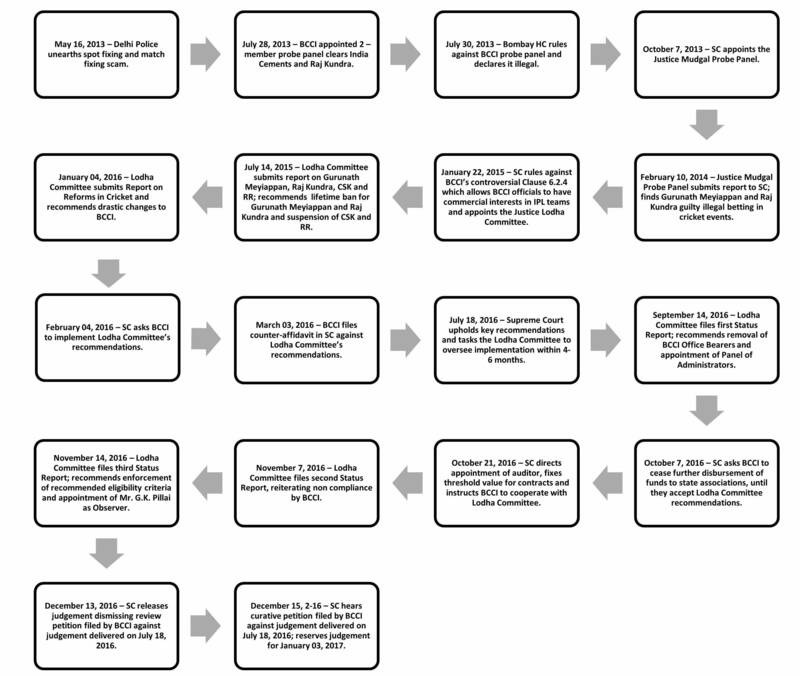 In addition, the Committee’s demarcation of conflict of interest situations into “tractable” and “intractable” conflict of interests appear to be based on principles followed in the IOC Code of Ethics, wherein conflict of interest situations are divided into either “potential conflict of interests” or “actual conflict of interests”. While the Committee’s guidelines have been viewed as restrictive in some quarters, as it may be argued that they limit the job opportunities and earning potential of former cricketers and professionals who have become accustomed to wearing many hats and carrying out multiple roles within Indian cricket, the likely upside is that the guidelines may enable professionals to specialise in their preferred field of expertise and take on full time positions for which they are duly compensated, rather than doing multiple piecemeal jobs as is the case currently. This could consequently result in the creation of more jobs in the Indian cricket system and could reset the expectations and demands of both employers and employees alike. In a pre-emptive measure, the BCCI had already introduced its own set of conflict of interest rules prior to the release of the Report and the recommendations made by the Committee. Unlike the Committee’s guidelines, the BCCI’s rules did not attempt to define what constitutes a conflict of interest situation and they also did not distinguish between tractable and intractable conflict of interests or potential and actual conflict of interests. The BCCI had also appointed an ombudsman (to be re-appointed at the BCCI’s annual general meeting annually) to investigate and adjudicate on any conflict of interest complaints and various disputes arising in the BCCI. This is a deviation from the Committee’s recommendation of appointing an Ethics Officer to investigate and resolve any disputes/complaints that may arise in relation to conflict of interest or any other ethic-related issues such as corruption within the BCCI. Another theme which appears in different areas of the Report is the Committee’s desire to protect the interests of cricketers. They are seen as forming the backbone of the sport. The proposed establishment of a players’ association has the potential to be a game changing recommendation in terms of player welfare in Indian sports administration. Several of the major cricketing countries such as Australia and England and less mature cricketing jurisdictions such as Bangladesh have already had independent players’ associations for several years. These players’ associations are in turn affiliated to Federation of International Cricketers' Associations (FICA), which is recognised by the International Cricket Council (ICC) and was established to coordinate the activities of national player’s associations of several cricket playing countries, including full members and associates. In India however, the BCCI has historically elected to tackle and address player issues in-house and has refrained from recognising any independent players’ association in India or affiliating with FICA. While FICA’s services and benefits are offered to professional cricketers throughout the world regardless of their nationality, the fact that FICA is not recognised by the BCCI appears to have made Indian cricketers reluctant to be involved in the activities of or avail of the benefits of FICA. Thus, there exists an opportunity to introduce a formal players’ representation body in Indian cricket to advocate the interests of professional cricketers across the country. A players’ association may be especially relevant and helpful for domestic and state level cricketers, who unlike their higher profile international counterparts, may not have ready access to the BCCI’s in house mechanism to address their concerns. However, it is important to note that the players’ association is proposed to be funded by the BCCI and the BCCI is also proposed to have the right to have a nominee on the board of the players’ association. Given the level of control that may be exerted by the BCCI, it remains to be seen whether the players’ association can function as an independent body that can effectively advocate the players’ interest especially when it comes to potential disputes or discussions with the BCCI itself. Furthermore, the introduction of an agent registration and vetting mechanism to complement the above measures is another notable initiative which could result in player agents and agencies being regulated and monitored. Agents are required to submit to a written examination followed by a personal interview, required to have knowledge of cricket regulations including the disciplinary and ethics related regulations specified by the BCCI or the IPL and are also required to submit police character certificates and clearance certificates at the time of registration. Regulation and monitoring of player agents, representatives and agencies is a long established practice in major sports around the world such as football, American football, basketball and baseball. Player agents have formed an integral part of these sports for a significant period of time due to the presence of player transfer systems and draft systems that require the services and expertise provided by player agents in the negotiation of contracts and commercial arrangements. With respect to cricket, however, the only commercial interests that cricketers conventionally have had to worry about were personal endorsements. 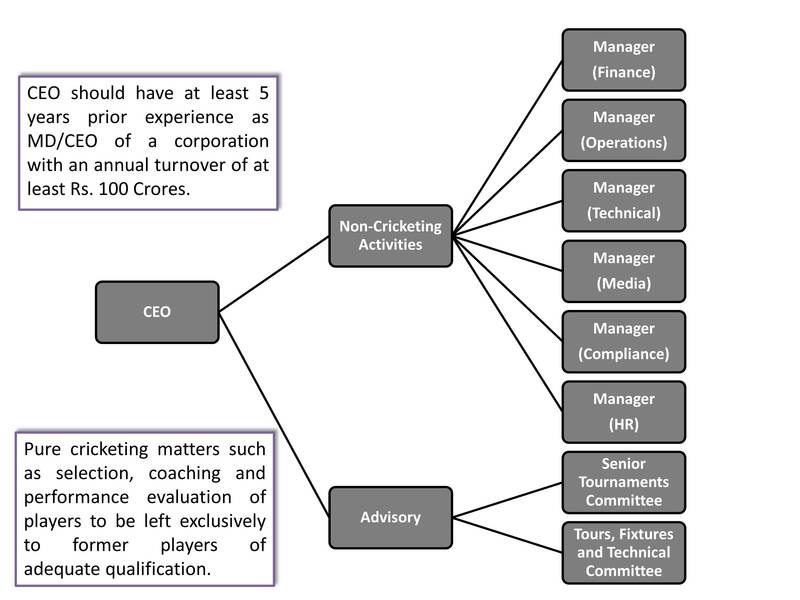 With the advent of professional twenty20 leagues and the capability of players to participate with multiple teams and thereafter have multiple playing contracts with such leagues, there is a growing demand for player agents to manage and negotiate interests, and thus a growing demand to regular and monitor such agents. Cricket boards such as Cricket Australia and the England and Wales Cricket Board have already initiated their own agent regulation and registration frameworks in partnership with player associations in their relevant jurisdictions. The ICC has not attempted to do this at a global or international level. This is a departure from the practice followed in the world of football, where the regulations prescribed by FIFA are supplemented by country specific regulatory frameworks that take into account local laws but are in line with the FIFA regulations. The Committee’s recommendations and suggestions with respect to safeguarding the integrity of cricket are also worth further examination. The alleged fixing and betting on IPL matches by team officials and players along with the associated conflict of interest issues that were raised in the aftermath thereof served as the triggers which started the process of BCCI reform. As mentioned in Section II earlier, the Committee has recommended that match fixing be criminalised and that betting be legalised in India, while drawing a clear distinction between the two concepts. In this regard, it should be noted that successive governments have been reluctant to legalise betting despite the lure of substantial revenues due to taxes, not to mention the benefits that would accrue due to dismantling or at least hampering a dangerous and unregulated industry that has often compromised the integrity of Indian sports and cricket in particular. This reluctance may stem from the difficultly of predicting the wider societal impact that a legalised betting industry and ecosystem would have on Indian society. In addition, the Committee has recommended that players, team officials, members and other persons associated with the BCCI or the IPL should be prohibited from betting on matches. Needless to say, the betting legislation and the prohibition on betting by relevant parties will have to be complemented by an appropriate and strong sporting fraud legislation or an amendment to existing statutes, as the current framework for punishing match fixing and spot fixing relies on legislations such as the Prevention of Corruption Act, 1988 and the Indian Penal Code, 1860 which do not deal directly with the subject and have therefore proven to be inadequate in addressing the problem. These betting and sport fraud legislations will have to be further supported by a strong enabling network consisting of betting operators, sports administrators, law enforcement and judicial authorities provided with adequate powers to tackle any sport fraud related cases that may arise. Finally, the recommendation to restrict advertising during international bilateral matches to only drinks, lunch and tea breaks, at first glance, appears to be at odds with the conventional broadcasting and commercial framework currently followed by the cricketing ecosystem. The numerous advertisement opportunities available during cricket matches in any and every break of play has conventionally been one of the key motivations for sponsors and advertisers to associate with cricket events around the world. While the committee has made this recommendation from the perspective of viewer comfort, restricting the advertising inventory available for broadcasters may affect the entire commercial model of international cricket. In formats that are already struggling for priority and relevance, these measures might potentially reduce sponsor participation, deflate advertising rates, reduce revenues to the broadcaster and consequently result in less money being paid for broadcast rights. On the other hand, these fears may be premature and possibly unfounded as the relative lack of commercial inventory available in other sports such as football appears to have not had a negative effect on the value of broadcasting rights with respect to premier footballing properties and tournaments such as the FIFA World Club and the English Premier League. Football, in contrast to cricket does not have regular advertising breaks during matches, and most advertising is restricted to the conventional fifteen (15) minute break between the two halves. Furthermore, restricting on air commercialisation may create a market for advertising where ‘less is more’ with competition for the limited inventory driving up interest and rates, as is the case with the Super Bowl. The Report immediately faced strong resistance from the BCCI, which opposed several of the key recommendations. This opposition and reluctance was echoed by several of the BCCI’s members, all of which either individually or alongside the BCCI moved the Supreme Court against the implementation of the Report. Eventually, on July 18, 2016, a two judge bench of the Supreme Court, comprising of Chief Justice T.S. Thakur and Justice Ibrahim Kalifulla, accepted a majority of the key recommendations made by the Committee. In this regard, the Supreme Court was of the opinion that it was necessary to have a much needed change in the current governing structure of cricket in India ("July Order"). With respect to the membership structure of the BCCI, the Supreme Court upheld the recommendation to convert non-territorial members (such as the National Cricket Club, the Cricket Club of India etc.) of the BCCI to the status of Associate Members without voting rights. The Supreme Court also upheld the controversial and much resisted “One-State-One-Vote” formula recommended by the Committee. However, in the case of Gujarat and Maharashtra which, as discussed earlier, each have three cricket associations, the Supreme Court held that such cricket associations would represent their respective State as Full Members ‘on a rotational basis’. Under such system, one of the associations belonging to either of these two States would act as a Full Member representing such State and exercise voting rights, while the other two associations from such State would act as Associate Members of BCCI during such period. The Supreme Court also clarified that the right of each cricket association to field their cricket teams, would remain unaffected under this revised structure subject to any changes that BCCI may make ‘in its wisdom’ in the future. Additionally, the Supreme Court upheld the Committee’s recommendations in relation to an upper age limit for office bearers, the bar on ministers and civil servants holding office in the BCCI or any of its members, the suggested limits on tenures of office bearers, and the restriction on holding dual positions in the BCCI and its members simultaneously. Furthermore, the Supreme Court upheld the Committee’s recommendation to induct one member nominated by the CAG to the BCCI’s Apex Council, despite the potential for such appointment to be viewed as “government interference”. Article 2.9 of the Memorandum and Articles of Association of the ICC prohibits government interference in the working or functioning of its members and is grounds for the ICC to suspend a member. In this regard, the Bench opined that a measure undertaken in an attempt to increase financial transparency and accountability in the BCCI would be appreciated by the ICC. It is noteworthy that the Supreme Court deviated from the position of the Committee with respect to a few recommendations and refrained from making them binding on the BCCI. Perhaps the most significant of these, was the recommendation to limit advertisements only to major breaks during play. In this regard, the Supreme Court opined that a limit or restriction on the airing of advertisements during matches will drastically reduce the commercial value of broadcasting rights and could have adverse effects on the sport itself. With respect to the recommendation to induct two representatives from the Franchisees in the IPL Governing Council, the Supreme Court requested the Committee to reconsider this recommendation. The Supreme Court was of the opinion that the question of whether such induction would lead to a conflict of interest within the Governing Council was not adequately addressed by the Committee. However, the Supreme Court further held that upon such reconsideration by the Committee, any recommendation made by it in this regard shall be implemented and adhered to by the BCCI. The Supreme Court also refused to impose a monetary value on the recommended funds for the establishment of the Players’ Association. The extent of such financial support to be accorded to the formation of a Players’ Association was left to the discretion of the BCCI. Finally, the Supreme Court recognised that the recommendations to bring the BCCI under the scope of the RTI Act and to legalise betting in India were the mandate of the legislature and were therefore not imposed on the BCCI. The Supreme Court placed the onus on the Law Commission of India to examine the viability of implementing these two particular recommendations and recommending a suitable course of action to the Central Government. The Supreme Court specified a deadline of four to six months to complete the implementation of the recommended changes and tasked the Committee to draw appropriate timelines for the implementation of the recommendations and oversee such implementation. In addition, the Committee was provided with the option to approach the Court and seek appropriate directions in the event that it faces any impediments or obstacles while carrying out its duties. The BCCI however, has remained steadfast in its opposition to the implementation of the Report, primarily basing its legal opposition on a separate report prepared by the Justice Katju Commission (“Katju Commission Report”). The Justice Katju Commission was a one member commission headed by Mr. Justice (Retd.) Markandey Katju, Former Judge of the Supreme Court of India, that was commissioned by the BCCI to advise it on the recommendations made by the Committee in the Report. The Katju Commission Report termed the recommendations made by the Committee in the Report as having no basis in law, and termed the July Order as judicial activism that overreaches its boundaries and has the effect of usurping legislative functions. The Katju Commission Report concluded by recommending that the BCCI file a review petition against the July Order in the Supreme Court, and request that such petition be heard by a larger bench. Failure to rectify the defects in the review petition filed against the July Order and have the same numbered and listed. In addition, the Committee also brought to the Supreme Court’s notice the BCCI’s disbursement of large amounts of funds to the state associations, which it termed as an act to present a “fait accompli”, in breach of the directives of the Committee. Further, it represented to the Supreme Court that the disbursement was undertaken without the formulation of a proper disbursement policy. The Supreme Court opined that the BCCI should have avoided the disbursement of the funds, and awaited the Committee’s decision on a disbursement policy in this regard. The Committee also drew the Supreme Court’s attention to an interview given by the CEO of the ICC, Mr. David Richardson, to a news publication. In the interview, Mr. Richardson referred to a request received by the ICC from the BCCI President for a letter which stated that appointing a member from the CAG’s office would amount to governmental interference in the functioning of the BCCI. In its reply to the Supreme Court with respect to the first Status Report, the BCCI objected to the timelines proposed by the Committee, stating that while the July Order had contemplated an implementation period of four to six months, the Committee’s timelines sought to hasten the process. The BCCI also opposed the dismissal of the current office bearers of the BCCI on the grounds that the removal of democratically elected office bearers would amount to judicial overreach and therefore be unconstitutional, as such a directive would be contradictory to the statue under which the elections were conducted. In addition, the BCCI argued that replacement of the current office bearers with third parties inexperienced in the administration of cricket would weaken the global image of Indian cricket and could have adverse effects on the sport itself. The BCCI also argued that the removal of the current office bearers was not within the purview of the Memorandum of Association that was recommended by the Committee in its Report and approved for implementation by the Supreme Court in its July Order. Therefore, such a request was unenforceable against the BCCI at a later stage. The BCCI was instructed to cooperate with the Committee and the auditors appointed by the Committee in the effective completion of their obligations by granting access to such records, accounts and other information as may be required by the Committee and the auditors. With respect to the letter request made by the President of the BCCI, the Supreme Court opined that this particular request was an attempt at putting on record the ICC’s opposition to the recommendation of the appointment of a CAG nominee to the Apex Council on the grounds of government interference in sports governance. However, the Supreme Court reserved any judgement in this regard. It is noteworthy that the President and the General Manager, Admin & Game Development of the BCCI, through separate affidavits clarified that the letter request was merely a request from the BCCI to the incumbent ICC President, Mr. Shashank Manohar, to clarify the position taken by him during his tenure as BCCI President regarding the appointment of the CAG’s nominee and its apparent conflict with Article 2.9 of the Memorandum and Articles of Association of the ICC, which prohibits government interference in the functioning of its members. Further, it was subsequently revealed by Mr. Gopal Subramanium, the Amicus Curiae to the Supreme Court in this matter, that the ICC President submitted an affidavit (“ICC Affidavit”) to the Supreme Court which stated that the letter was requested in a meeting wherein the ICC directors and the ICC CEO were present. According to the ICC Affidavit, the BCCI President had allegedly requested the ICC President to state that the recommendation of appointing a CAG nominee would be in violation of Article 2.9 and therefore, grounds for immediate suspension. Subsequent to the October Order, the Committee filed a second Status Report with the Supreme Court. However, the contents of this Status Report are not yet available in the public domain. More recently, the Committee submitted a third Status Report with the Supreme Court on November 14, 2016 and requested the Supreme Court to enforce the recommended eligibility criteria for office bearers of the BCCI and state associations. In the third Status Report, the Committee stated that a large number of current office bearers do not meet the standards and eligibility criteria prescribed by the Committee and requested the Supreme Court to dismiss such persons who do not meet the criteria. Moreover, the Committee requested that the Supreme Court appoint Mr. G.K. Pillai, former Union Home Secretary, as an ‘Observer’ to oversee the BCCI’s day to day administration through the CEO of the BCCI and recommended that the CEO be entrusted with the responsibility to carry out all administrative requirements of the BCCI without advertence to the current office bearers. The Committee further sought that the Observer be empowered to appoint an auditor and such other secretarial staff as contemplated by the Supreme Court in the October Order. Meanwhile, in a decision passed on November 10, 2016, the Supreme Court has dismissed the review petition filed by the BCCI against the July Order, on grounds of insufficient reason. Thereafter, in a hearing on December 15, 2016, the Supreme Court took note of the ICC Affidavit and criticised the BCCI’s actions in this regard. The hearing further recorded the Amicus Curiae’s suggestion that Mr. G.K. Pillai, Mr. Vinod Rai (the 11th CAG) and Mr. Mohinder Amarnath (former Indian cricketer) be appointed as administrators to oversee the interim functioning of the BCCI, while the current office bearers are relieved of their positions. The BCCI remained opposed to the appointment of Mr. G.K. Pillai as an administrator and the Supreme Court has therefore, instructed it to file an affidavit containing names of such persons that are acceptable to it as replacement for the names suggested by the Amicus Curiae. As of the date of the publication of this article, the BCCI has filed a curative petition and the matter remains pending in the Supreme Court. The Supreme Court is expected to deliver its decision on January 3, 2017, which incidentally happens to be Chief Justice T.S. Thakur’s last day in office as the Chief Justice of India. Thus, the long drawn out legal proceedings in this matter may be set for a dramatic conclusion. The Report recommends a significant structural overhaul of all aspects of the BCCI’s and its members’ functioning and provides a detailed framework through which reforms may be implemented. These include a number of notable recommendations that seek to safeguard cricket at the national, state, local and grassroots levels. The actual measurable impact of the Report can be determined only once the recommendations of the Committee have been carried out. Regardless of what actually happens in the future, the Committee has certainly set a modern standard of governance and provided prudential norms for not only the BCCI but other sports governing bodies in India to aspire to. The future acts of sports bodies and administrators will now be judged relative to these norms. The Report is in itself a gift to Indian sport generally and sportspersons and fans alike. Since this article was published, the Supreme Court has, through an order dated January 2, 2016, effectively removed the BCCI President, Mr. Anurag Thakur and BCCI Secretary, Mr. Ajay Shirke, from their posts by ordering that they immediately “cease and desist” from being associated with the BCCI. While expressing its disappointment over the current BCCI Office Bearers’ continued “intransigence” in this matter, the Supreme Court highlighted the need to undertake coercive steps to ensure the implementation of the Recommendations. In the order, the Supreme Court observed that Mr. Thakur had obstructed and impeded the implementation of the directions given in the July Order and that such conduct rendered him unfit to continue as the BCCI President. The Supreme Court was also of the opinion that Mr. Thakur’s conduct made him liable to be proceeded with for contempt of court and that he had knowingly made false statements in the affidavits submitted by him with respect to the letter request he made to the ICC Chairman. In this regard, the Supreme Court directed that two separate show cause notices be issued to Mr. Anurag Thakur, seeking an explanation as to why the court should not initiate proceedings against him for: (i) perjury, under the provisions of Section 195 read with Section 340 of the Code of Criminal Procedure (CrPC); and (ii) contempt of court, under the provisions of the Contempt of Courts Act, 1971. In addition to the incumbent BCCI President and BCCI Secretary, the Supreme Court also disqualified, with immediate effect, all such Office Bearers of the BCCI and State Associations who did not meet the eligibility criteria recommended by the Committee. All Office Bearers who meet the eligibility criteria have been directed to provide undertakings within four weeks of the date of the present order, stating their commitment to adhere to the Recommendations, in order to continue in their current positions. Further, the senior most BCCI Vice President and the BCCI Joint Secretary have been instructed to assume the functions of the BCCI President and BCCI Secretary, respectively, provided that they met the eligibility criteria for Office Bearers specified by the Committee. With respect to the administration of the BCCI, the Supreme Court stated that it would, through a separate order, appoint a ‘Committee of Administrators’ to supervise the BCCI’s administration, which would be undertaken through the BCCI’s CEO. In this regard, the Supreme Court has requested Mr. Gopal Subramaniam, the Amicus Curiae (impartial advisor to the Court) in this matter and Mr. Fali S Nariman, Senior Counsel, to assist the Supreme Court in the constitution of the Committee of Administrators. Additionally, Counsel appearing on behalf of the parties in the legal proceedings, including the BCCI, have also been given the opportunity to suggest potential members for the Committee of Administrators. The Supreme Court has tasked this Committee of Administrators that is eventually constituted to implement the July Order and supervise the work of those existing Office Bearers who fulfil the eligibility criteria. Finally, the Supreme Court accepted the Committee’s recommendation that the role of the Committee henceforth be limited to “overall policy and direction” of the BCCI on such matters as may be referred to the Committee by the Supreme Court. Subsequently, on January 3, 2016, Mr. Nariman requested the Supreme Court that he be recused from assisting the Supreme Court in determining the Committee of Administrators, citing a prior commercial relationship with the BCCI as the reason for the request. The Supreme Court accepted his request and appointed another Senior Counsel, Mr. Anil Diwan, as a replacement. The next hearing in this matter is scheduled for January 19, 2017, wherein the Supreme Court is expected to announce the persons nominated for the Committee of Administrators. Board of Control for Cricket in India v. Cricket Association of Bihar, Civil Appeal No.4235 OF 2014, order dated January 22, 2016, available at: https://supremecourtofindia.nic.in/FileServer/2015-01-22_1421928541.pdf;https://judis.nic.in/supremecourt/imgs1.aspx?filename=43799; order dated October 21, 2016 available at https://judis.nic.in/supremecourt/imgs1.aspx?filename=44255; and order dated https://judis.nic.in/supremecourt/imgs1.aspx?filename=44446 (last accessed on January 2, 2016). Board of Control for Cricket in India v. Cricket Association of Bihar, Civil Appeal No.4235 OF 2014, order dated January 22, 2016, available at: https://supremecourtofindia.nic.in/FileServer/2015-01-22_1421928541.pdf;https://judis.nic.in/supremecourt/imgs1.aspx?filename=43799; order dated October 21, 2016 available at https://judis.nic.in/supremecourt/imgs1.aspx?filename=44255 (last accessed on July 25, 2016). Zee Telefilms v. UOI, (2005) 4 SCC 649, dated February 02, 2005. Board of Control for Cricket in India (BCCI), Decisions by Ombudsman, available at: https://www.bcci.tv/news/2016/bcci-news/13270/decisions-by-ombudsman (last accessed on July 25, 2016). Justice Lodha Committee, Report of the Supreme Court Committee on Reforms In Cricket, available at: https://lodhacommittee.wordpress.com/2016/01/04/report-on-cricket-reforms/ (last accessed on July 25, 2016). International Olympic Committee, Code of Ethics, available at: https://www.olympic.org/Documents/Commissions_PDFfiles/Ethics/2016_ioc_code_of_ethics-en.pdf (last accessed on July 25, 2016). Board of Control for Cricket in India (BCCI), BCCI Memorandum and Rules and Regulations, available at: https://www.bcci.tv/about/2015/bcci-rules-regulations (last accessed on July 25, 2016). Board of Control for Cricket in India (BCCI), BCCI Rules on Conflict of Interest, https://www.bcci.tv/news/2015/bcci-news/11912/bcci-rules-on-conflict-of-interest (last accessed on July 25, 2016). R. Seshank Shekar and Abhinav Shrivastava, Comparative Governance Practices in Sport, The Sports Law and Policy Centre, Bengaluru, available at: https://goo.gl/d7LuLP (last accessed on July 25, 2016). Zee News, Players' agents to have test, interview and police clearance, suggests Lodha Committee, available at: https://zeenews.india.com/sports/cricket/lodha-committee-suggests-test-interview-police-clearance-for-players-agents-report_1842874.html (last accessed on July 25, 2016). The Hindu, Lodha report addresses key areas that need reform, available at: https://www.thehindu.com/sport/cricket/lodha-report-addresses-key-areas-that-need-reform/article8065450.ece (last accessed on July 25, 2016). ESPNCricInfo, For transparency and oversight, RTI and independent watchdogs, available at: https://www.espncricinfo.com/india/content/story/957981.html (last accessed on July 25, 2016). ESPNCricInfo, https://www.espncricinfo.com/india/content/story/975317.html (last accessed on July 25, 2016). ESPNCricInfo, MCA to file intervention application on Lodha report intervention, available at: https://www.espncricinfo.com/india/content/story/968987.html (last accessed on July 25, 2016). ESPNCricInfo,Supreme Court gives BCCI one month, little wriggle room to respond to Lodha report, available at: https://www.espncricinfo.com/india/content/story/973623.html (last accessed on July 25, 2016). Hindustan Times, Supreme Court reprimands BCCI boss Anurag Thakur; apologise to escape, it warns, available at: https://www.hindustantimes.com/cricket/supreme-court-reserves-order-on-appointment-of-observer-for-bcci/story-LDcVdEek9N361JgweacvjJ.html (last accessed on December 15, 2016). Supreme Court Committee on Reforms in Cricket, available at: https://lodhacommittee.wordpress.com/ (last accessed on December 14, 2016). Federation of International Cricketers Association, FICA’s Vision, available at: https://www.thefica.com/ (last accessed on July 25, 2016). The Professional Cricketers’ Association, About Us, available at: https://www.thepca.co.uk/about_us.html (last accessed on July 25, 2016). The Australian Cricketers’ Association Inc., About Us, available at: https://www.auscricket.com.au/about-us/aboutus (last accessed on July 25, 2016). Seshank is an Associate at LawNK, a Bangalore based niche law practice specializing in sports, intellectual property, media and information technology laws. Anirban is an Associate at LawNK, a Bangalore based niche law practice specializing in sports, intellectual property, media and information technology laws.